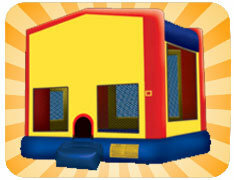 Our brightly colored Modular bounce house will be a hit at your party! Kids love the bright colors and the large jumping surface that this bounce house has to offer! Our large bounce houses offer a 15 foot by 15 foot jumping surface, which is larger than the jumping surface in our regular bounce houses.